Pale Moon version 25.2.1 has been released to address cookie handling through proxies causing issues for some authenticating proxies in corporate environments. Mozilla sent Firefox Version 35.0.1 incorporating bug fixes to the release channel. unresolved -- Sometimes images don't display when hovered over (see bug 1083113)-- marked Resolved/Won't Fix. unresolved -- WebGL games might not display some textures (see bug 1113633) -- scheduled for version 36. Although not expected until next week, Adobe has released the update addressing a Zero-Day being distributed through the Angler Exploit Kit in Adobe Flash Player. The vulnerability was discovered by security researcher Kafeine (See Unpatched Vulnerability (0day) in Flash Player is being exploited by Angler EK | Malware don't need Coffee) and applies to Adobe Flash Player 16.0.0.287 and earlier versions for Windows and Macintosh and Adobe Flash Player 11.2.202.438 and earlier versions for Linux. for those who have Flash Player set to auto-update. The direct download links are not expected to be available until next week. Edit Note: (1/25/2015) The direct download links are now available. See below. Adobe is working with Google Chrome and Microsoft to provide the update for Chrome and Internet Explorer on Windows 8.x and Windows 10 Technical Preview. Adobe has released security updates for Adobe Flash Player 16.0.0.257 and earlier versions for Windows and Macintosh and Adobe Flash Player 11.2.202.425 and earlier versions for Linux. "The vulnerability that Adobe patched Thursday is under active attack, but Adobe officials said that this flaw is not the one that security researcher Kafeine said Wednesday was being used in the Angler attacks." The Threatpost article further indicated that there is no indication from Adobe officials that an update is in the works for the Angler zero-day vulnerability. The update below has been released by Adobe to address the vulnerability. It is strongly advised that the update be applied as soon as possible. "The most severe of these vulnerabilities received a CVSS Base Score of 10.0. This score is reported for 4 distinct Java SE client-only vulnerabilities (CVE-2014-6601; CVE-2015-0412; CVE-2014-6549; and CVE-2015-0408). Out of these 19 vulnerabilities, 15 affect client-only installations, 2 affect client and server installations, and 2 affect JSSE installations." With this release, the SSLv3 protocol (Secure Socket Layer) has been deactivated and is not available by default.It should be noted that SSLv3 is obsolete and should no longer be used. 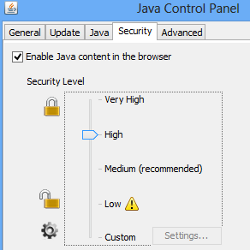 Additionally, the SSLv3 protocol is removed from the Java Control Panel advanced options, although it can be re-enabled manually, described in the below-linked Release Notes and Assurance blog post. There has been a lot of recent controversy regarding Java updates for Windows XP. While Windows XP has reached end of life, Java 7 will continue to be updated until April, 2015. Thus, organizations and individuals who must continue using Windows XP and have Java installed can also continue getting updates for Java 7. It is noted, however, that if an issue arises that is specific to Windows XP, Oracle is not required to and also may not be able to create a patch. For additional information, refer to the Oracle blog post, The future of Java on Windows XP (Henrik on Java). Pale Moon has released version 25.2 to extend browser capabilities and implement some ES6 draft functions for web programmers. The update includes important crash fixes, bug fixes and security updates. Fixes and changes are documented in the Release Notes. Mozilla sent Firefox Version 35.0 to the release channel. The update includes nine (9) security updates, three (3) of which are Critical, one (1) High, four (4) Moderate and one (1) low. Microsoft released eight (8) bulletins. One (1) bulletin is identified as Critical and the remaining seven (7) are rated Important in severity. The updates address 8 unique Common Vulnerabilities and Exposures (CVEs) in Microsoft Windows MS15-001 and MS15-003 have been publicly disclosed. Details about the CVEs can be found in the below-referenced TechNet Security Bulletin. Although it was officially released in May, 2014, non-Security updates include the release of .NET Framework 4.5.2 to Automatic Updates, WSUS, and Catalog. Because many people have problems with .NET updates, it is strongly recommended that they be installed separately from other updates with a shutdown/restart. Outdated ActiveX control blocking will be added to Windows Vista SP2 and Windows Server 2008 SP2. See the TechNet article, Out-of-date ActiveX control blocking and the IE Blog for information on what this entails. For those interested in determining specific updates applicable to their operating system, see myBulletin. The updated version includes the Win32/Emotet and Win32/Dyap malware families. Additional details ave available in the MMPC blog post. Adobe has released security updates for Adobe Flash Player 16.0.0.235 and earlier versions for Windows and Macintosh and Adobe Flash Player 11.2.202.425 and earlier versions for Linux. Version 16 of Adobe AIR has been released. Adobe AIR version 16 has been released. The latest version is 16.0.0.272. Congratulations! We are pleased to present you with the 2015 Microsoft® MVP Award! This award is given to exceptional technical community leaders who actively share their high quality, real world expertise with others. We appreciate your outstanding contributions in Consumer Security technical communities during the past year." 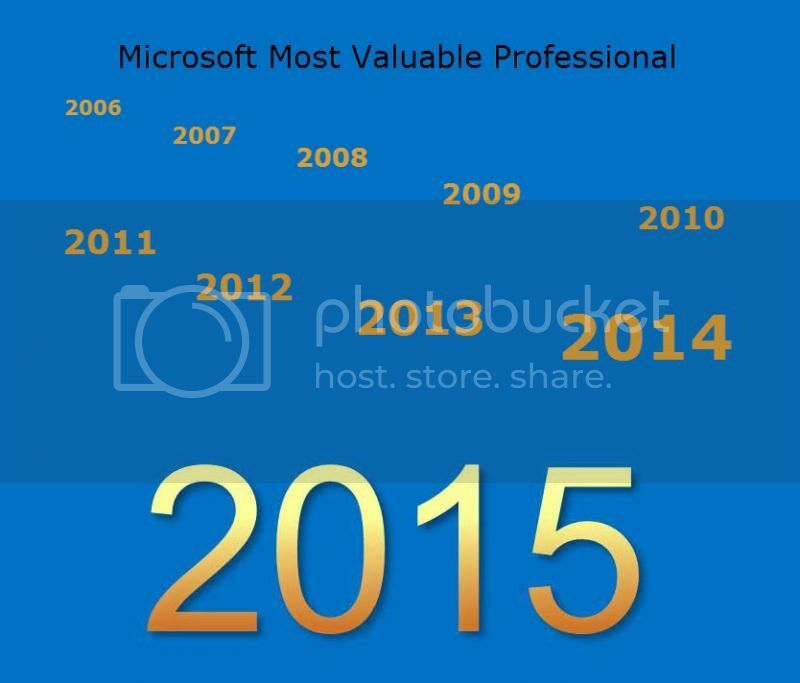 Each year since receiving the first award as Microsoft Most Valuable Professional ten years ago, ringing in the New Year has been a special occasion. It became a time of reflection on the previous year as well as renewed enthusiasm for continuing to provide help in the year ahead. This year, rather than reflecting on the past, I extend my heartfelt thanks to family and friends for their love and support in dealing with the loss of my husband. He will always be in my heart. To each of you, I wish a very happy and healthy year ahead. May 2015 be filled with all things positive and all your dreams come true!